Today I bring you a podcast interview with singer, actress and entrepreneur Christina Milian and her business partner Josh Bocanegra who together have built a company called Persona. Persona is a tech company that builds chatbots for celebrities. They’ve built chatbots for reality TV star Jwoww, literary film character Christian Grey, model Karrueche Tran, musician Kehlani and more. “Celebrities are the trendsetters. People want a way to speak to their fans in a way that’s real. They want their voice to be heard in a way that’s authentic,” said Milian. Celebrities today are brands. Thanks to social media, celebrities have the ability to engage with fans directly. Though most don’t. Why? It’s not possible. With millions of Instagram, Snapchat, Twitter and Facebook fans, celebrities generally engage in one-way conversations on social media. Brands have a similar conundrum. They can’t respond to the millions of social media comments they get from customers. And they’re using chatbots as a way to provide tailored and personalized interactions. Chatbots have the potential to scale and provide personalized interactions in a way that hasn’t been possible in the past. Milian has over two million people messaging her on her bot. She says this was the fastest growth out of any social media she’s ever done. 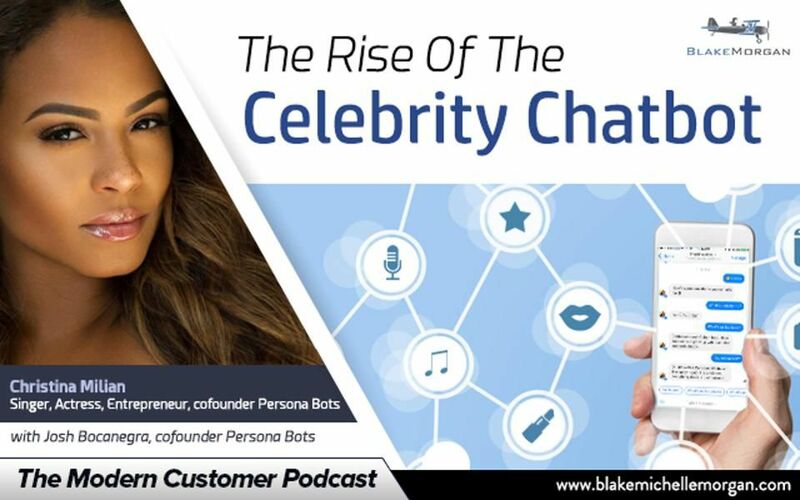 According to Milian the goal for the chatbot, built through Facebook messenger, is to keep the fans there engaging with her on Facebook messenger. She believes people don’t want to be bothered with ads. And messenger provides a direct and uninterrupted channel with the consumer, sans ads. More and more we are seeing the collision of tech and celebrities. Even Ashton Kutcher has invested in 60 companies including Airbnb, Flipboard, and Change.org. The next few years will only bring more celebrities into the world of tech. It makes sense for celebrities and tech to get together considering tech brings a large platform to celebrities for them to create and share media, and celebrities bring other celebrities and fans to these platforms as well. When I ping Christina Milian’s chatbot on Facebook messenger, she responds “oh hey…” Her chatbot is fond of using the kiss emoji and that makes sense considering Christina’s brand. In fact, in our podcast interview, she mentioned much of what chatbot users ask her is if she’s single, and will she marry them. In fact, her business partner mentions one unique interaction that occurred on Milian’s chatbot. A girlfriend of a male chatbot user found his phone, and thought Milian was really engaging with her boyfriend through messenger, according to Bocanegra. Bocanegra says the user’s girlfriend became very jealous; a testament to the power of chatbots. Some people don’t even realize it’s a machine at all. As Milian builds Persona Bots and her own chatbot the variety of ways you can interact with the chatbot will grow. Today you can view Milian’s latest music, request a signed autograph, learn more about Christina’s personal life (mentioned earlier), shop for fan gear, her clothing line, or her line of wines called Viva Diva Wines. The chatbot is not perfect, however, it’s one of the first I’ve seen that grants fans the ability to interact with Christina on chat, the same way one would interact with a brand. We’ll only see these technologies grow.